Even though the New York (St)rangers dropped their final game on the all-Canadian leg, this time to the Edmonton Oilers in overtime -- though a stinky game as usual, the last 2 minutes happened to be some of the most exciting hockey this season. Specialized Clutch-man New York Ranger Chris Drury scored in the final seconds of the third period to tie-up the game, eerily reminiscent of his clutch-goal for the Buffalo Sabres that turned the course of our playoff run last season. The Dark Ranger feels a new beginning is approaching. 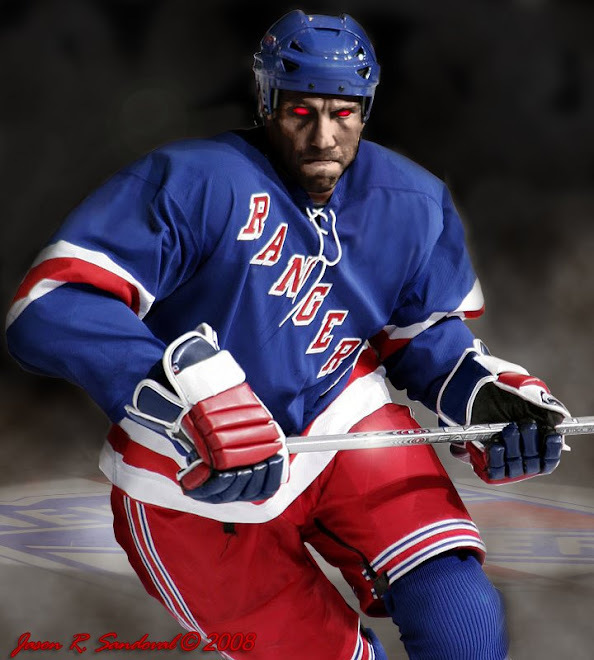 I am becoming more comfortable with the Rangers losing most of their games these days, and strangely more comfortable with Marek Malik, Marcel Hossa, Jason Strudwick, Tom Renney and Jaromir Jagr. Why might you ask? They are all survivors in a system that should naturally filter them out. Darwinism screams that 'the strong will survive' and they are present, playing and making an impression. It may not be the impression that us Rangers fans support, one that puts the team in jeopardy of not qualifying for the playoffs and it leaves a generally bad taste in our mouths, but someone seems to like them. I may see these as bad impressions that disintegrate the franchise, but apparently these sub-par players, coaches and captains are able to live through anything at this point. There are plenty of games left in the season. No problem - just get out on the ice, work as hard as you can, butter up to whoever necessary and get the job done. It's not about winning or losing, it's about how you work it, baby! As long as you sell every ticket to The Garden, monopolize our cable service, sell Vitamin-Water sponsorships, these players are the 'golden children' to management, The Untouchables. Carry on dear hockey-players and coaches -- continue to entertain the masses with your profiteering. 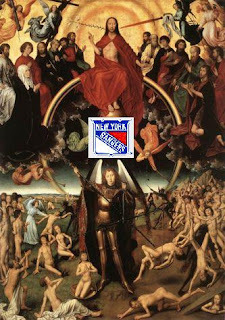 Just never forget there is a bigger idea ahead, an air-of-change upon us, and there will come your time of judgement when those hockey loving 12-year old boys want a poster of a 'hockey blogger' on their wall instead of a Captain or Coach. May The Dark Ranger Live Forever! May Those Who Belong In Hockey Live Twice As Long! Amen reverand. I missed the pregame show, why was Callahan not playing? I presumed it was illness or injury. It's becoming too predictable these games. pucks...Callahan should be sent back up to Hartford for a little motivation training again. Though, I am a fan of him, he hasn't scored once in the last twenty games. He opened well, but has fallen into our team mediocrity spirit. And they shall feel the wrath of The Dark Ranger. All good things come to those who wait, and wait, and wait, well you get the idea. 2) So should the Rangers feel like they've turned a corner if they eat up the Lightning? Why not. To start a surge you have to beat everyone, so why not star with the worst team and go from there? faux...you didn't have the pleasure of watching the Rangers lose at the beginning of the season to The Thrashers....the worst team in the league creamed us. I have no expectations at this point -- a WIN would be nice, but...what would be the antonym of 'chemistry'?